5	stars -	"Review for Oneill Womens Bahia LS Front Zip 1.0 mm Jacket Black Purple Pink" Mark Taylor This Oneill Womens Bahia LS Front Zip 1.0 mm Jacket Black Purple Pink is the best Thermal Wear Ladies I have tried. 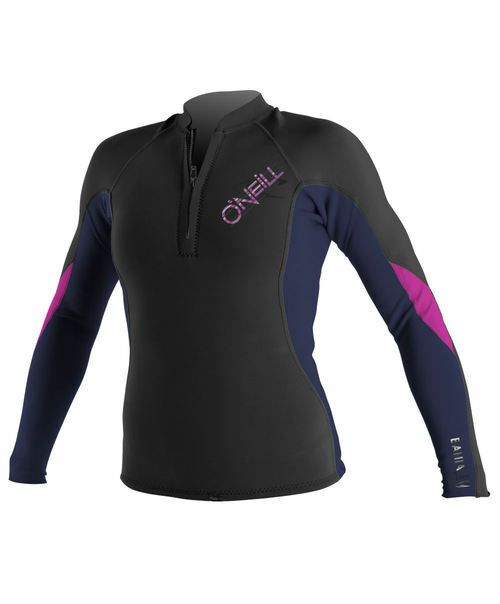 O'Neill Bahia is designed for a new generation of athletes who want to bring beauty, personality and confidence to the water. The combination of chic styling and absolute function makes Bahia a unique wetsuit line for the style-savvy and performance-driven athlete.